I’ve written before on how pushing myself, while a long-time habit, ultimately doesn’t get me where I want to be, especially in the area of improving my vision. It also doesn’t help me be happy. It makes me feel tense and pressured, even though I am the one doing the pushing! As much as I’ve read about clear healthy vision being a relaxed state, not a tense striving one, and as much as I’ve experienced the difference in how it feels for myself, I can still default to the habit of pushing myself if I’m not really paying attention. “I have to do palming more regularly!” my self-talk tells me, or “It’s been days since you did any dedicated Long Swing practice, Nancy!” (with a strong tone of blame). This does not motivate me — it makes me want to rebel. Even though what I’m being urged to do is for my own good, the bossy manner of the message means I’m not even listening to the content. How do I motivate myself to do other things which are good for me, like exercise? That has never been a problem, even if I’m feeling sluggish or lazy when I start. One factor is looking at the words I use. When I talk about exercise, I’ll say “I want to do a leg workout” or “I’d like to go for a walk”. Not “I have to…” as if it’s a major chore, or drudgery. Hmm…. Maybe I could even say to myself, honestly, “I get to take a palming break now!”, like it’s a treat, which it definitely is. The other factor I notice here is time pressure. When I rush a weight workout, not taking the time to properly warm up, or hurrying through the post-workout stretching, it’s not as satisfying, and sometimes I even injure myself. This was not the goal of the workout! This is like doing a session of palming while mentally watching the clock, wondering “Am I finished yet?”. This attitude of urgency is contrary to the fundamental goal of relaxation, and might even give you a headache, or eye strain! You have plenty of time to improve your vision, all the time in the world. So watch how you talk to your eyes and visual system. I recommend being gently encouraging, with large doses of praise and gratitude. Remember the saying about catching more flies with honey than with vinegar — a sweet attitude gets you farther than a sour one. And appreciation usually brings you more to appreciate. Look at all you can see, don’t over-focus on what’s not perfectly clear yet. I challenge you to look at one thing in your surroundings right now, whether it be a pencil on your desk or the text on your computer screen or a tree out the window. Really notice the details, and how well your vision is working. The more you look, in an easy relaxed way, the more you will see. We need to tread lightly as this is Nancy’s article and discussion, so I’ll be brief. I read more than half of Dr Bates’ bookn (and need to finish it). I stopped because some aspects of his method were a bit confusing to me. In the meantime David Keisling (associated with this website) suggested the book ‘Take Off Your Glasses and See’ by Jacob Liberman. That book in combination with Nancy’s very helpful insights is helping me. Liberman writes very clearly and you can pick up a clean USED copy for about $6 delivered from Amazon.com. Look it up on Amazon and see what you think. Maybe if I had read Liberman’s book first I would have had no trouble understanding Bates. You’re right. I apologizeto everyone for talking up a storm in the comments. I will take a good look at that book! Thanks Tom. I’m NOT AT ALL QUALIFIED to say what you’re experiencing with regard to pin-hole glasses. My opinion is based only on observations and research pertaining to my own weird situation. I don’t quite understand what you’re seeing. You say the multiple images DO line up as ONE IMAGE. Isn’t that the desired correction of your vision? Thank you for the reply and link. It’s very insightful. So basically what happened before all this if I remember correctly is that ai had really bad hyper tension causing optic nerve swelling ( this was caused by a false tumor hyper tension thing) The multiple image , with pin holes, makes the ghost image less morphed and perfectly clear..under the true image so I guess it wouldn’t be double vision then ? I guess I should get in contact with a neuropthamologist ? I do see a pressure on the back of my eyes as well but the doctors don’t see a problem with pressure . I kind of regret not that the spinal tap when all of this was going on at the time. I think I messed up badly causing this to happen. Maybe I could talk to a doctor online but was wondering if the bates method could help with this either way. Thanks for the additional link. I’ve read about 2/3 of Dr Bates’ Better Eyesight Without Glasses (must finish it) and while I “get it” I was having trouble understanding the concept of “shifting.” My recent experiments with Open Focus have led to perceived “shifting” of the scene, and your linked article, “How Do I Practice Central Fixation” really clarifies the notion. Yes, my business card says I can help you with your eyesight, and your insight. 😉 And I think these are very connected! Tracy, one more thing: remember “test anxiety” can show up in an eye test too. So if she knows her eyes are going to be tested, maybe she can do a bit of palming first to relax, breathe deeply, and tell herself “I can see everything fine!”. I love it that you said she can see the blackboard fine — have her keep reminding herself of that. Hi Nancy, thanks so much for your tips. Your kind words do ease my worries quite a bit. And it feels so good to have your backup and makes me feel that im not alone after all. No one in my life, esp. my hubby, believes in natural vision improvement. Hubby thinks its ridiculous to even think about it, so im quite frustrated with him oftentimes. I ask him to keep his opionions to himself and let me help our daughter in my way. Thanks again for your kindness. Ill always remember that. Thanks for responding Tom! Also the pin holes sadly down get rid of the double gision and just reflect the real image but they do line up the multiple images as one images. So do you think that’s still an optical problem? If you’re interested in a free consultation, to see if a formal Skype session or 2 with me could help you or your daughter, or both, you can request that here: http://nancylneff.com/discovery.htm. In any case, keep the focus on enjoying seeing, and being relaxed about it. And thank you so much for your positive comments. Take care. Tracy. Thank you Nancy for responding. I actually see multiple images that are positioned differently in each eye. When I wore the pin hole glasses the multiple images were lined up perfectly under the real image. I hope that isn’t a bad sign. Catherine, again, I’m not an eye doctor, so I’d ask one if you’re really concerned. My guess is all it means is that the 2 eyes are straining in different ways. This is not a problem, just something to notice, and keep paying attention to as it changes. Like Tom, I think the pinholes are helping you with central fixation, which is harder for you to do naturally without them. I’m struggling with a truly weird issue wherein I see MULTIPLE images, particularly noticeable when looking at a small light such as the pilot light on a television or other electronic device. The same (blasted) anomaly appears in both eyes, and looking through pinhole glasses DOES clear it up. Finances are a problem so I have not been diagnosed, but I’m pretty sure I’m dealing with Polyopia, and perhaps (shudder) Cerebral Polyopia. I would like to know if Catherine’s issue has been professionally diagnosed, and if so, the prognosis. Also, if you, Nancy, can shed any light on this (but only ONE light, not the TWENTY+ I typically see, HA!) I’d be truly grateful. And FWIW, my own experiences/progress are directly in line with your comments, Nancy. I think much (all?) of this is “between my ears” rather than in my eyes. To me this is just your particular flavor of straining to see. That you don’t see multiple images with pinholes tells me your central fixation could use some improvement. When we’re stressed it can be a survival habit to try to see everything at once. If it were me, I’d play with different distances — can I see single images 2 or 3 feet away, but start seeing multiple images at 10 feet? Does that mean at 10 feet I don’t feel safe? If so, what can I do about that, to calm my nervous system? Hey, Tom. I did get a visual field test done and it was normal so my ophthalmologist said it wad most likely due to an astigmatism. I still don’t know if I can trust that diagnosis but I don’t really have the money to see another one right mow. 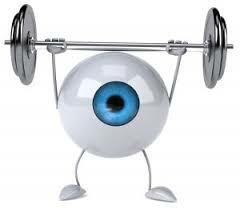 As someone that has double vision in both eyes I want to improve as fast ad I can to get better. It’s been rather frustrating to not be able to enjoy my hobbies like reading and drawing. I wonder if it’s possible to get better though. Catherine, it is definitely possible. One of my early teachers told me double vision is better than no vision! It feels to me like you’re trying too hard, which is what this culture teaches as the way to accomplish anything. Your visual system is constantly adjusting itself, trying to make the view clearer for you, and the less we get in the way of that the better it works. Vision is more in the brain than in the eyes. Play with letting yourself see instead of trying to see. Tom, yes! More and more, I am learning to approach everything, even if it seems like a problem at first, with an attitude of “What is this trying to teach me?”, or “How can I have fun with this?”. A very helpful reminder of how important MINDSET is in everything we do. I tend to procrastinate, even with regard to enjoyable, creative work. I seem to suffer from a longstanding “fear of failure” which turns everything–including my vision improvement–into a chore, and sometimes a dreaded chore. Thanks for this nudge toward objectivity and GRATITUDE for all the good in these OPPORTUNITIES for expression and improvement. I read your blog posts regularly and find them quite pertinent. Does it mean then that the first step is to learn how to relax our mind and (hence) our eyes? Shika, I’m glad my articles are helpful. Actually, the very 1st step is awareness of how you’re feeling about seeing, and how you’re looking (with strain or not). See this: https://www.iblindness.org/2024/which-vision-exercise-relaxation-and-awareness/. That was a wonderful article and relevant to my life, thanks. Thanks, Kate. Glad it was helpful. Vision improvement can be enjoyable, even fun! It doesn’t have to be hard work.